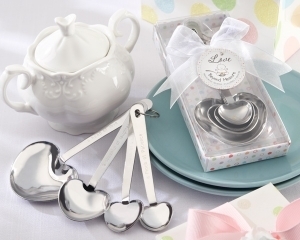 Heart-shaped measuring spoons are crafted from stainless-steel. The four spoons feature "measures of love" on one side with traditional measurements on the other: "A Pinch of Patience" = 1/4 teaspoon; "A Dash of Kindness" = 1/2" teaspoon; "A Spoonful of Laughter" = one teaspoon; "A Heap of Love" = one tablespoon. Spoons measure approximately 5" h x 2 1/4" w.
Delightful gift presentation includes a white box covered with multi-colored polka dots and circles, a white-organza ribbon and bow, and a matching tag with a baby sitting in a spoon and the words "Love Beyond Measure". Gift box measures 5 3/4" h x 2" w x 1" d.
Please allow up to 7 business days to fulfill your order; then add ship time from GA.